Want to interact with global travellers, exchange stories, and form a great bonhomie? Then you must check into Elysium Inn Hostel – a traveller’s hostel – located in Khairatabad. Think of bunk beds, amicable strangers, and epic conversations on globetrotting and exploration is what Elysium Inn Hostel is all about. Whether you’re a solo traveller or visiting Hyderabad for the first time — this is a great pad for you to crash. But if you’re a Hyderabadi who is interested in listening to some travel stories and add a dash of yours to them, you might want to check if they’d let you stay. It has an appearance of a hole in a wall place from the outside, but step in and you’ll find a hostel vibe. 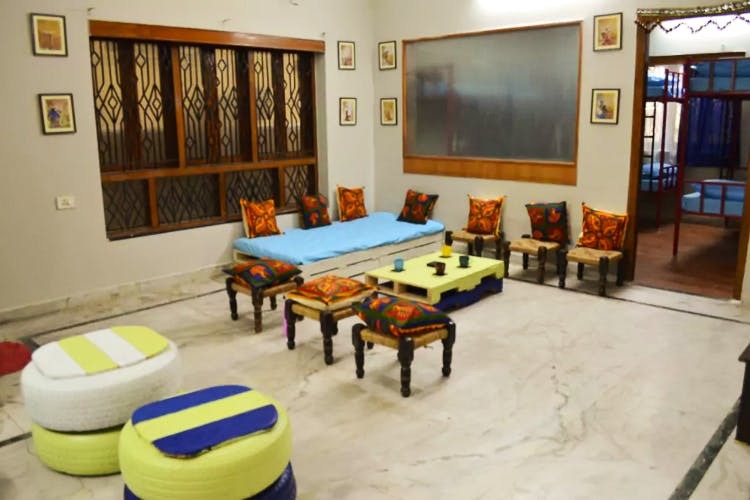 The living room is decked up modestly with bright handpainted tables, low jute stools, and printed cushions. You and your new friends can settle for a night of chilled beer. The bedrooms are more of dormitories with a mix of a female dorm room, a shared dorm room, and a private twin-bed room. The dorm rooms have bunk beds while the twin-bed room has two single cots with handmade decor accents that match the living room. In fact, even the common dining area has similar decor with painted rubber tires used as seating chairs. Are you a Famous Five junkie or someone who grew up poring over all things Enid Blyton? Then you’d love to share their kitchen and dining area with fellow travellers. Whether you’re interested in sneaking out a midnight snack or interesting in making a morning cuppa with your new roommates, Elysium is your oyster! This makes for a great getaway particularly because it’s located in a prime area which is well-connected to the city. Although, do note that this hostel is only for travellers and group bookings of backpackers aren’t usually accepted. This place is not suitable for pets, children below the age of 12, or smokers. Kindly respect the rules and maintain cleanliness while here.